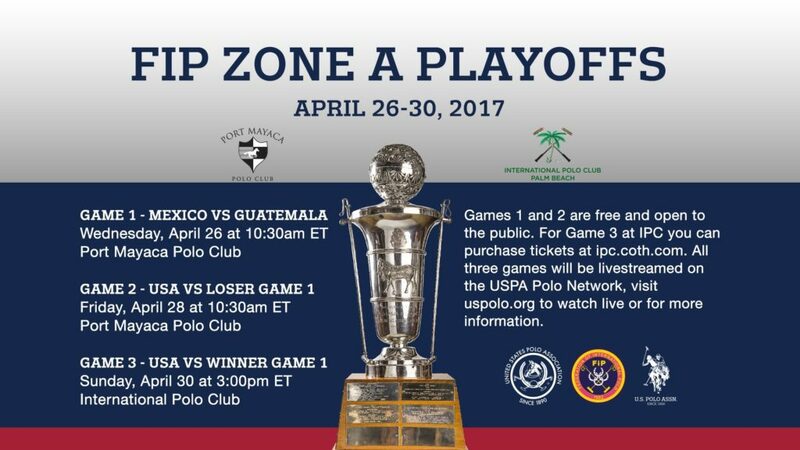 The United States Polo Association (USPA) is proud to announce that the Federation of International Polo (FIP) has awarded the World Championships Zone A Qualifying Tournament (FIP Zone A Playoffs) to the USPA. The tournament will be played April 22-30, 2017 in South Florida. Stick and ball, practice games and the first two days of tournament play will be held at Port Mayaca Polo Club in Okeechobee, Florida. All horses will be stabled at Port Mayaca’s club barns. The final games will be held on Sunday, April 30 on Field 1 at the International Polo Club Palm Beach. It is anticipated that four teams (USA, Canada, Mexico and Guatemala) will compete in the event. The USA team will be selected from Team USPA players. Practice games for all teams. Light stick and ball sessions. Light stick and ball, penalty shot practice. The last time the USA Team won the FIP World Championship was in 1989 in Germany. Winning team members were Julio Arellano (1), John Wigdahl (4), J. Horton Schwartz (4) and Charlie Bostwick (5). To learn more about the United States Polo Association, please visit their website at www.uspolo.org.